I’ll let you know the results after a few different attempts at Facebook ads. 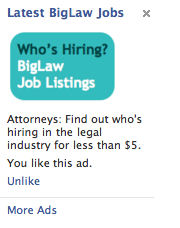 Attorneys, Find out who’s hiring in the legal industry for less than $5. Here’s the real question: Does it entice you? It’s nothing fancy. The slides are hard to see on the video. I posted them underneath… which is a less-than-satisfactory fix for following along onscreen. For anyone who thinks it’s a good idea to print them as handouts, well, my suggestion is to do it in grayscale. But, hey, it was my first YouTube video! Don’t expect Tim Burton or anything! This is web development in action. On the video, I demonstrate an easy tool to help visualize how a person or entity presents him/her/itself on the web. Although the chart is not lawyer-specific, I had created this tool to analyze how BigLaw firms – the Am Law firms – present themselves on the web as service providers and businesses. I needed a simple way to assess the firm’s web development and this is what worked. I started this project in late February. It’s late July and I’m still not finished. Why has it taken me so long? Well, for one, data retrieval is time-consuming! This is true in spite of the invaluable resources I had at my disposal, e.g., Kevin O’Keefe’s State of the Am Law 200 Blogosphere, Greg Lambert’s List of Large Law Firm’s “Officially Sanctioned Blogs,” Patrick DiDomenico’s list of law firms on Twitter, or Bruce Carlton’s BigLaw Lawyers on Twitter. The other big hurdle that I’ve encountered is that I haven’t figured out a “pretty” way to publish the scores. Posts sort of cram the information together and become quickly outdated. Plus, text documents are not the optimal solution when collecting, calculating, or comparing data. On the other hand, spreadsheets lack room for thoughtful analysis. By late May, I was itching to find a better way to proceed with the BigLaw Tech Scores. Borrowing the open-source mentality, the #AMLAWTweeple list is public (and costs nothing!). Moreover, others are enabled and encouraged to add to it. 3. to respect people’s privacy. I’ll address these objectives in reverse order. I am not ashamed to plug my internet stalking (er, research) skills. In fact, if you want to know about my mad skills, you can ask me to help you find something – anything – on the internet. Therefore, on the #AMLAWTweeple list, I decided to only include people who wanted to be found. I inferred someone wanted to be found if s/he listed the firm at which s/he worked in his/her Twitter profile; if s/he linked to his/her firm URL, or if s/he used a firm e-mail address. How did I go about finding people – who wanted to be found – to add? For brevity’s sake, I will refer you to Greg Lambert‘s comprehensive post on 3 Geeks and a Law Blog entitled “Competitive Intelligence in a Web 2.0 World – Part 1: Finding Company Employees on Twitter.” The post describes the type of tools that I used to find #AMLAWTweeple. As I mentioned in the comments on Greg’s site, Tweepz.com was my favorite tool for finding #AMLAWTweeple. On Tweepz, I would search for firm domain (e.g. kslaw.com) as well as by firm name (e.g. King & Spalding). On the other hand, even if someone showed up in one of my searches and approached me and requested to be removed or requested that I not add them at all, I obliged. Right, so here’s this new tool, “Twitter,” a microblog through which we can make all these new connections, a global water cooler. Nevertheless, as I looked around the blogosphere, I saw lists of Tweeple – any type of Tweeple list – compiled and published on static posts. Anyway, I decided to see how this tool worked in action. The #AMLAWTweeple list may be published to my blog, but I also tweet my research and directly ask the #AMLAWTweeple who I find if they know anyone else with a Twitter account at their firm. By approaching #AMLAWTweeple directly, this alerts anyone who’s included on the #AMLAWTweeple list about my project. If people would like to add accounts, they can respond to me (@mjsq) (public), DM me (private), or e-mail me (even more private). It also gives #AMLAWTweeple another chance to send me a (polite) request if they wish to be removed. While I am less stringent about my public search requirements for word-of-mouth add-ons – mainly because I trust the legal industry’s professionalism – I always tweet updates to the list and @reply people directly. Again, the #AMLAWTweeple project started as a method to combat the pitfalls of the BigLaw Tech Scores, as I described above. There are many fantastic resources out there listing lawyers on Twitter, BigLaw lawyers on Twitter. There are even LinkedIn Groups for lawyers and law firms on Twitter. The #AMLAWTweeple list is not a replacement for any of these sites. It’s my research that I’m sharing with everyone in order to encourage people to share their knowledge with me. With that said, add to it, revise it, manipulate it, comment on it, or respond to it. And, please, please, please tell me if you want off of it. This is the second post in the #AMLAWTweeple series. Be sure to read the first post in the #AMLAWTweeple Series and take a look at the #AMLAWTweeple chart. ¹ In case you don’t want to watch my video, to determine a firm’s BigLaw Tech Score, I search for Facebook groups, LinkedIn profiles and groups, Jigsaw listings, official blogs, unofficial blogs, podcasts, whether the firm offers webinars, etc. For firms with blogs and podcasts, I also list how the firm creates the blog/podcast, how it hosts the blog/podcast, and how the firm is analyzing its visitors. To calculate the BigLaw Tech Score, a firm receives a certain number of points for each element that adds to its web presence. I’d like to emphasize that all of the information that I find is available in Google searches or by interpreting a firm website’s source code. ³ I tag all relevant tweets with the hashtag #AMLAWTweeple. In Twitter, people can click on the #AMLAWTweeple link to view all tagged tweets. 4In the third post in this series, I’ll talk in more detail about what I think Am Law firms can gain from being on Twitter. 5In fact, all writers on my other website – http://nonpretentious.com – publish under pseudonyms. This way, writers have total control over how and to whom they reveal their online identities. They can learn to write for the web without worrying who is reading their material. 6 Again, I emphasize this as a warning and a disclaimer because these searches are easy for anyone to duplicate. 7 The Twitter names show up in real time. I edit the submissions and link ‘em back to Twitter. When you hear the words “social media” what comes to mind? This wasn’t much of a multiple choice. These four responses are all valid. So are countless other ones. Before I continue analyzing BigLaw’s web presence or explain Twitter Karma, TwitterFeed, TweetLater…or even explain the answers to the multiple choice question above…it’s time to put social media into context. Social media is the combination of activities that come together in a medium using one or more senses of sight, sound, or motion to create visual displays, picture-sharing opportunities, and the creation of shared-meaning through words and pictures by people. It is defined as engagement over a medium as compared to face-to-face. Social media uses the “wisdom of crowds” to create information in a collaborative manner. Social media can utilize many different forms, including text, images, audio, and video to provide context and meaning. Social media can take many different forms, including message boards, weblogs, wikis, podcasts, pictures, and video. Technologies such as blogs, picture-sharing, vlogs, wall-postings, email, instant messaging, music-sharing, group creation, and voice over IP, to name a few. Examples of social media applications are Goggle (sic.) (reference, social networking), Wikipedia (reference), MySpace (social networking), Facebook (social networking), Club Penguin (children’s social networking), iTunes (personal music), YouTube (social networking and video sharing), Second Life (virtual reality), and Flickr (photo-sharing). Primarily, social media depend on interactions between people as the discussion and integration of words to build shared-meaning, using technology as a conduit. Social media utilities create opportunities for the use of both inductive and deductive logic by their users. Claims or warrants are quickly transitioned into generalizations due to the manner in which shared statements are posted and viewed by all. The speed of communication, breadth, and depth, and ability to see how the words build a case solicits the use of rhetoric. Induction is frequently used as a means to validate or authenticate different users’ statements and words. Rhetoric is an important part of today’s language in social media. Social media is not finite: there is not a set number of pages or hours. The audience can participate in social media by adding comments,instant messaging or even editing the stories themselves. OK. We know the properties and qualities of social media. Based on this description, however, should lawyers care about social media? If so, why? How will social media benefit someone in the legal industry? In fact, not to be a contrarian, but shouldn’t lawyers focus on the law? To answer these questions, we’ll look at the tools we have available and the possible uses in a legal practice. We’ll also figure out how to analyze our results, focus on the R.O.I. to determine how these tools play a role in our overall business strategy and, therefore, how we should allocate our time. I must reiterate that there’s no right answer to any of these questions. With no right answer, social media is a bit of trial and error to find out what works for you, your clients, your firm, and your bottom line. The extent that lawyers and law firms implement social media into their business models will vary. Not only between solo practioners and large firms, but between practice groups within the same firm or even between office locations. For the site, I will publish four articles per week (most likely, Monday, Wednesday, Friday, and every other Sunday night). The first article of each week will be available to the public. The second two articles will be available to registered subscribers. One time subscriptions (4 weeks of content) will be available for $12.95. 6-month subscriptions will be available for $9.95/month. Those who purchase either subscription, for the duration of their subscription, I will be available for unlimited e-mail correspondence to answer questions, brainstorm, problem-solve, network, etc. Of course, social media requires a dialogue. Whether you pay for a subscription or read the first article of the week, please feel free to comment on any of the posts, ask questions, pose hypotheticals, question, and challenge. Moreover, I’d love to hear from lawyers who have implemented social media tools about their results. What worked? What didn’t? I’m open to phone, face-to-face interviews, or guest posts. Though I’m rambling about lawyers, I’d also love to hear from law firm marketing departments, recruiting departments, associate development committees, associates, and support staff about their thoughts on social media and how it works. On the other days, I will be available for individual and group consulting sessions. Depending on the needs of the session, it may be an hour or a full-day workshop. Depending on costs and location, these can be done by video conferencing or in person. My goal is to keep prices reasonable and competitive. As a former recruiter, I am also happy to assist companies with finding the right person to handle and organize the web strategy within the firm. While it is not necessary to bring in an outside person to run the firm’s “social marketing campaigns,” the talent that is there needs to be quite clear about their strengths and weaknesses in terms of the overall plan. Again, I am happy to consult during the preliminary stages on finding the most rock star team. Not only is the website often split between marketing and IT, it is also usually under-resourced. Instead of there being a dedicated Web team, those responsible for the website are often expected to run it alongside their “day job.” When a Web team is in place, it is often over-stretched. The vast majority of its time is spent on day-to-day maintenance rather than longer-term strategic thinking. This situation is further aggravated by the fact that the people hired to “maintain” the website are junior members of the staff. They do not have the experience or authority to push the website forward. It is time for organizations to seriously invest in their websites by hiring full-time senior Web managers to move their Web strategies forward. Finally, the legal industry is what I know best. Law school is where I first became passionate about social media when I realized there was an exchange taking place in the blogosphere between lawyers, judges, law professors, and little 1L me was invited to share my opinions! Nevertheless, the topics we’ll cover may be relevant to a number of different industries and/or professions. Feel free to listen in and share your own insights. With that said, there’s still a 24-hour countdown until the new site (…how I wish I could have three more days…). For the first few weeks, during the transition, there may be some kinks. If you ever need an article e-mailed to you, let me know. So, this is a little like hello post and a little like a goodbye post. We’re moving up in the world.